Best Book in the series! That’s because each book just gets better than the last! Sarah Sundin’s writing is so vivid and her characters are so well rounded, that I actually felt as though I was part of the story. I worried, I laughed, I cried, I got angry, I held my breath, I longed to give advice ….. I grew as close to Ray and Helen as any reader can get to story characters. This story was so amazing — all three books of it — that I didn’t want it to end and despite a wonderful conclusion, I felt somewhat bereft when I turned the last page. I will definitely be looking for Sarah’s next book! 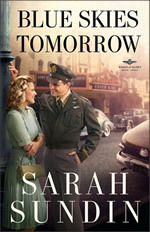 , the final installment of the Wings of Glory series, Sarah is giving one lucky winner A Vintage Kindle Prize Package! To enter just click one of the icons below. But, hurry, giveaway ends on 9/10. Winner will be announced on 9/12 at Sarah Sundin’s blog. Details and official rules can be found when entering the contest. 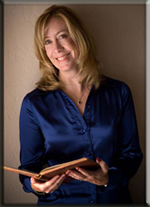 Sarah Sundin is an on-call hospital pharmacist and holds a BS in chemistry from UCLA and a doctorate in pharmacy from UC San Francisco. Her great-uncle flew with the US Eighth Air Force in England during WWII. Sarah lives in California with her husband and three children. This is her second novel. For more info please visit her website at www.sarahsundin.com! Charlene – thank you so much for the lovely review! I’m so glad you enjoyed Ray & Helen’s story! i think i might like to read this. i entered the contest! Great series. But those in-laws! Wanted to clobber them!! Very nice. The book seems to be an interesting read and a free Kindle is a perfect idea. I will enter the contest as well.